It is our choices that make us what we are, whether made in a conscious or unconscious mind and likewise the consequences to be dealt with. 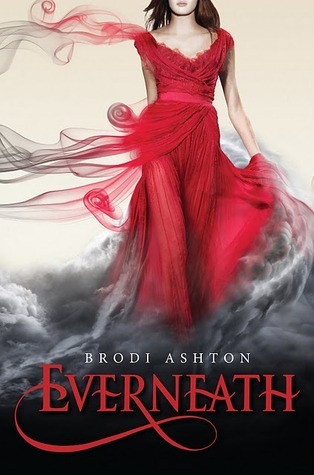 So begins Everneath #1 Everneath by Brodi Ashton. That cover sure is amazing. Folklore and Mythology is one topic or subject that has too many opportunities that can be of use. Every civilization has its own treasures. Every folklore and every myths all round the world while they may just be stories, are based on some truths and this was how Everneath got its backdrop. Nikki Beckett has forfeited her life. Too much pain and heartbreak makes a person want to take drastic measures to overcome this pain.....note I'm not talking from experience but I've heard from others. So Nikki has forfeited her life in exchange for forgetting that pain, a century has passed but that brown hair and the brown eyes and the way his eyes would captivate her and all of her problem would be gone....Nikki still can't forget this person, can't seem to forget her anchor to the surface world, can't forget Jack for that was his name. Nikki returns home to the surface to say goodbye, a proper goodbye before the tunnels came for her. Getting accustomed to life again, school, family, friend and most importantly Jack. Nikki knows she has forfeited her life and chosen the easier way out but things never get easier the next time round. She gets attached again and doesn't want to say goodbye, not yet at least but can she and Jack do anything about it before Cole or even the tunnels come for her. Is there really a way out of it? That's that and i'm not saying anything more about it at all, I've tried to keep it spoiler free and interesting for you guys to get the general summary of the story. Now its time to move to the technicalities of this book. Nikki is a broken soul, there is not another word to describe her. Her home life isn't always good, she tries to go through school, well in the context of her returning to the surface rather painfully, trying to make amends, trying to find peace. But most of all she is human and not at all perfect. When in pain she chooses the human approach, the easy way out and in her case forfeiting her life. Jack Caputo is a jock, a typical high schooler but not just that, he also loves Nikki. Its not a phase for him it seems. He truly cares about Nikki and does all he can to keep her away from Cole and the tunnels. Such love is not always seen in reality but Nikki and Jack share such love. Every scene with them together was amazing, every feeling they share would leap up at you through the pages and make you feel the bitter-sweetness of it all. Cole is an everliving, he feeds on the emotions of the humans to sustain his life. But what is an everliving or for that matter the Everneath? Well myths and folk tales speak of Heaven and hell but Everneath is the in between, a place where those who have found the secret to immortality stay. A promising start; strong characters as well as a strong, new and fresh story line and concept. Masterfully crafted situations enough to evoke strong waves of emotions inside of you. Nikki with her imperfections, Jack with his everlasting love for her and Cole for his incessant search for his Queen, this book is sure to surprise you in every way you can ever imagine. Kudos to the author for a great book effectively delivered upon its readers. So excited for the next book in the series and what its going to bring upon us. "You can't always have what you want.....but can Nikki evade the tunnels, can she evade the debts but most of all can she spend the rest of her surface life reconnecting with Jack, when she knows that this won't last? - Find all these questions answered in the masterfully crafted Everneath by Brodi Ashton"
"I was in the neighborhood," he said, answering the question I was about to ask. His lips twitched. "You know, wandering around, trying to be a hero." "He was at once severe and beautiful, and the more the played, the more I felt surrounded by that cushion as well, as if I could fall and never hit the ground, as long as he was playing." "We'd both been stripped of all the evasiveness, all the lies, everything we'd ever kept from each other. Layer by layer, we had given up our defenses and our excuses and our demands for whys and hows, and what was left were two broken beings. Clinging to one last shred of hope. Tethered to each other." "In the dark, dank world of the Tunnels, I would call upon this memory. And there would be a flicker of candlelight. If only for a moment. I closed my eyes, as if my eyelids were the levers of a printing press, etching the fibers into my mind. Memories were outside Cole’s reach. As long as I held them, memories were mine and mine alone." "There is no evil. There is no good. There is only life, and the absence of life." Just shared the link with like every page and group and timeline on Facebook. And tweeted. Have fun! :-) Great review... VERY ENTICING!! New follower via book blogs, thought I'd say hi! Trev @ trevsliteraryreview.blogspot.com! I'm so glad you liked this. Everyone seems to be raving about it. I'm hoping to pick it up in the next few days. Found this book to be ok.
Do prefer Cole but Jack is cute to always love her.